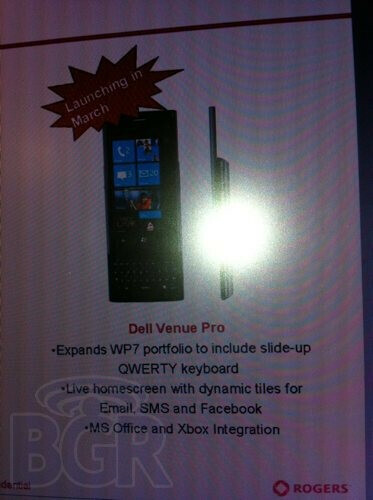 After hearing about Dell’s commitment to Windows Phone 7 after seeing some resounding figures being pulled in with their Venue Pro handset, we just might see their sole WP7 offering splashing in Canada very shortly. As it stands right now, one of the most highly regarded Windows Phone 7 handsets out on the market right now seems to be ready for a launch with Rogers in Canada. Although there are no official confirmations from the carrier or Dell directly, it wouldn’t surprise anyone to find the Dell Venue Pro being rolled out to other carriers around the world. Already, we’re on the verge of seeing the QWERTY portrait slider hitting the shores of the UK – so the potential of it bound for Rogers is likely. 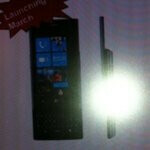 So far, there is no indication as to an exact timing in March for its release or pricing. Nevertheless, Canadians all around should more than likely be acceptable in mood regarding this handset.